The first Disney-era character-origin story hits theaters Friday amid a new hope for the franchise. By now, the overplayed talk show gimmick of "surprising" a guest with a walk-on by a co-star or other celebrity comes off as tired and phony. But when "Entertainment Tonight" recently sprung Harrison Ford on Alden Ehrenreich, the young actor's reaction proved anything but, well, forced. His 28-year-old face traveled at hyperspeed from stunned to thrilled, with traces of awe and fear – pretty much how any of us would respond. "Get out of my chair," Ford barked with faux gruffness. Unlike the rest of us, Ehrenreich gets to sit in 75-year-old Ford's Millennium Falcon seat in "Solo: A Star Wars Story." The latest tale of a long, long time ago opens Friday with a lot more than the fate of the fastest hunk of junk in the galaxy on the line. The flick marks the first of the new generation of character-origin stories – a key test in Disney's so far successful effort to make good on its $4 billion investment by reviving George Lucas' space opera with prequels, sequels and spinoffs. Origin epics, though, can be particularly tricky: The story needs to stand on its own, while competing against – and gelling with – memories of what came before in theaters and after in the series timeline. Upping the stakes is presence of Ford, an iconic actor behind iconic characters. He’s been down this early days reboot road before: The “Young Indiana Jones” TV series debuted in 1992 to mixed results. “Star Wars” also has a dubious record in extending its story by looking back – Lucas’ three prequels infuriated many fans. Still, when the approach works – as with Princess Leia’s surprise cameo at the end of 2016’s “Rogue One: A Star Wars Story,” a great ah-ha! moment – it’s enough to transport us back to a happy place, far, far away. In “Solo,” directed by Ron Howard, we’ll learn how Han met Chewie, then a spry 190 years old, and his frenemy, Lando Calrissian, originally embodied by Billy Dee Williams. Lando, conspicuous by his absence so far in recent films with original “Star Wars” cast members, is played in “Solo” by rising superstar, Donald Glover, just off his triumphant second season of “Atlanta” and his searing “This is America” music video. But Ehrenreich’s most in danger of being overshadowed, on screen and off, by the specter of Ford. That's no surprise: The gamut of emotions his “Entertainment Tonight” stint inspired would be enough alone to fuel a “Star Wars” installment or two. In the “Solo” trailer, Han’s “I’ve got a really bad feeling about this” catchphrase morphs into a sunnier “I’ve got a really good feeling about this,” delivered in Ehrenreich’s version of Ford’s tough-guy drawl. Variations on the phrase have turned up in early reviews. 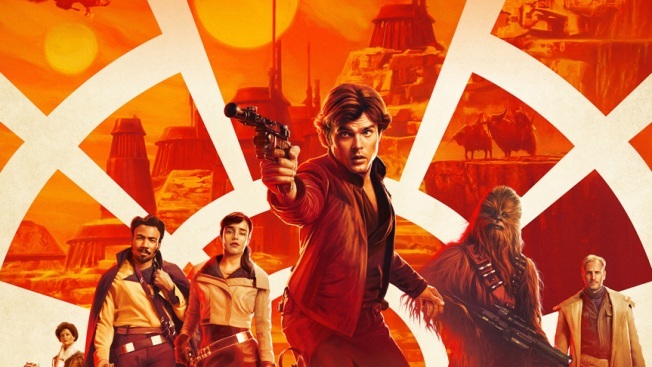 Fans need to go into “Solo: A Star Wars Story” with a feeling that the familiar is going to be different – but with a renewed hope that it’s going be great.